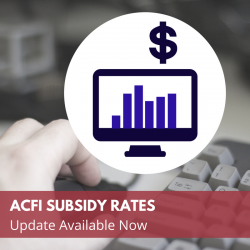 The new Residential Aged Care subsidies have been published for July 2018 to June 2019. AutumnCare has made the required form changes and these are ready to be deployed to AutumnCare client systems. Please contact AutumnCare Support to arrange a suitable time for the new subsidy rates to be applied to your system. Alternatively, you may schedule your update by phoning 1800 422 472. Find out more about the new subsidy rates at the Department of Health.